The recipes in Lisa Bacon's Turkey Cookbook are as freestyle and eclectic as her sculptures. Her creative use of turkey was ahead of its time, and was only the tip of the iceberg when it came to creativity in the kitchen. She delighted in the colors and textures and flavors of food, and would joyfully encourage others to see food through her eyes. "Oh! How magnificent!" she would exclaim as she held up a thin slice of tomato to the sunlight that streamed through the kitchen window. "Come! Look at this! Isn't it marvelous? Isn't it absolutely amazing what God has created?" She didn't mind the juice that dripped from the slice onto the counter, as it only reinforced the beauty and wonder of this lustrous creature called "tomato." 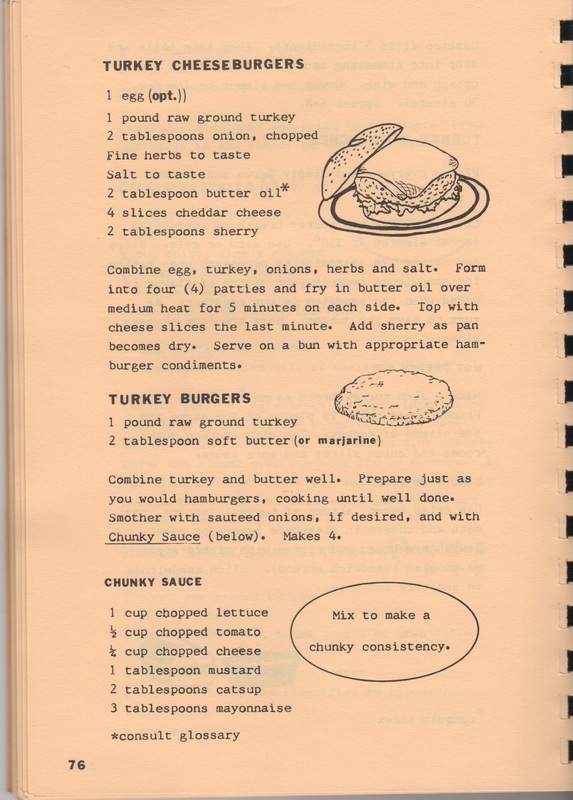 Here are a couple of pages from her cookbook espousing the glory of turkey burgers, which today are common items on restaurant menus and can even be found in bags in the frozen food aisle. 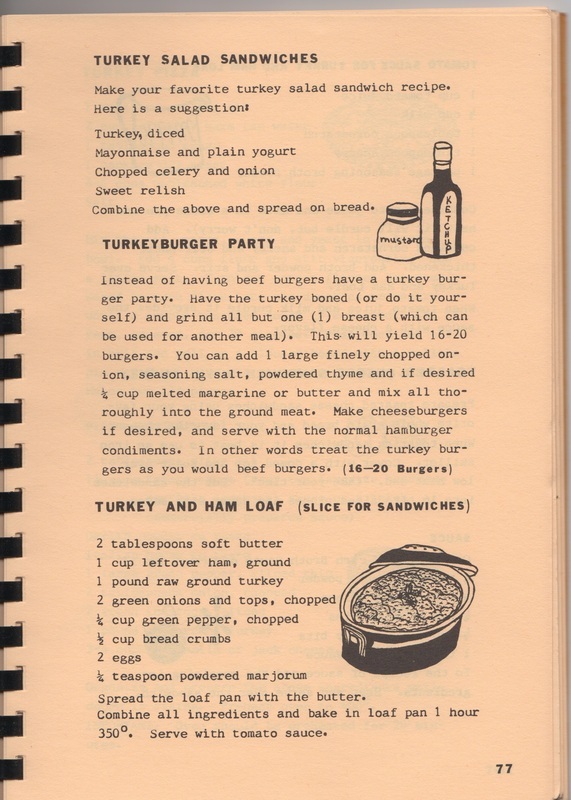 However, as you'll see in these pages, the point of her cookbook was to utilize an entire turkey for the creation of dozens of recipes. Turkey burgers required the grinding of meat from scratch! It makes us wonder whether Lisa's cookbook was the inspiration that Jennie O found to create an industry! Combine turkey and butter well. Prepare just as you would hamburgers, cooking until well done. Smother with sautéed onions, if desired, and with CHUNKY SAUCE (below). Makes 4 burgers. Mix to make a chunky consistency. Click here for more turkey recipes.